For more than 40 years I have been moved, impassioned and motivated by my love for the sea. Although I always tried to have a positive impact on the environment, as the years passed I started to notice big changes in the different ecosystems I was diving in. I felt I needed to do more to look after them – but what could I do? In 2005 I chanced upon competitive free diving, taking part in a small competition and ending up qualifying for the world championships. Having achieved a top-10 finish in three out of four disciplines, I decided that I would apply myself and see what I could really do. By the end of 2006 I had gained a top-2 ranking in several disciplines and was the top-ranked male at the world championships. Now, I thought, sponsorship money will flow – how wrong I was! As I continued to excel at competitive diving I realised that I might be able to leverage my free-diver status to make a difference. In 2008 the Malpelo Foundation in Colombia invited me to put my breath-hold diving skills to use by tagging sharks. It needed the information it could glean from tags to better protect the highly migratory scalloped hammerhead shark. From there I started to look at how I could offer even more help. Since many research expeditions were being cancelled due to lack of funds – in some cases there was not even enough money to buy tags – my wife and I decided to look for funding. We finally found a foundation in Geneva, Switzerland, that was willing to provide finances on a small scale on condition that we set up a non-profit organisation. That is how the Watermen Project was created. I have kept a high profile on the competitive free-diving scene because breaking records draws media attention and can thus be a useful tool. I found that I was able to leverage my title as holder of the world record for free-diving to shed light on the plight of sharks. This was particularly relevant when I was in Australia in December 2013, having been asked to promote the IMAX 3D film Great White Shark. 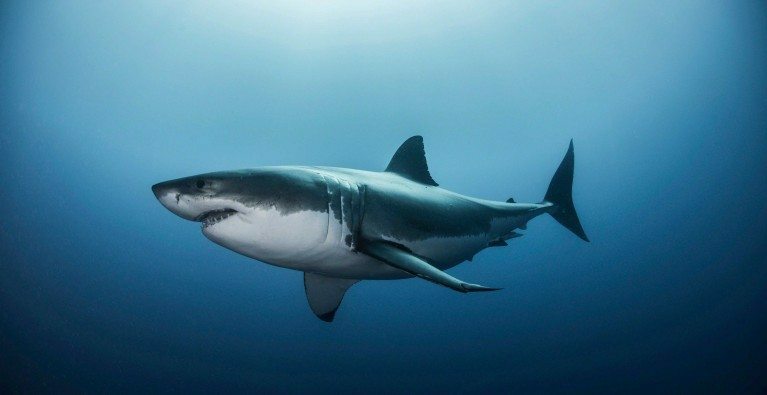 Two fatal shark bites coincided with my trip and, needless to say, I had to answer many questions from journalists. Being a world-record holder opens doors, and I take the opportunity to educate the public and dispel common misconceptions about the unfortunately vilified predators that are sharks.